I finally got into the classroom. YAY! I swear time just flies by when there is so much to do. While I got a lot done there is still SO much to do! AHHH! 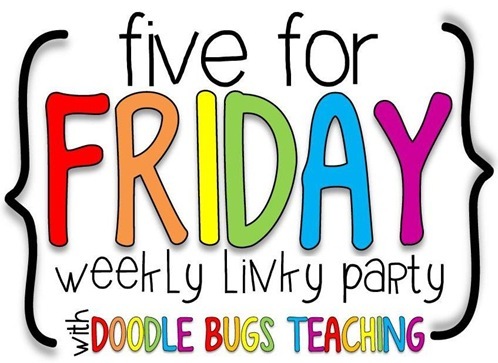 It's the perfect time for me to link with Kacey @ Doodle Bugs Teaching for the Five for Friday. I made this fish door décor from the burlap that my mom sent me. I didn't realize that the classroom door was blue or else I would have painted the fish a different colour. It still turned out pretty good though. Okay since I am sharing a classroom & the other teacher wasn't there I didn't know which of the 2 bulletin board I should decorate for my class so I just chose the smaller one so that the other teacher would get the larger one since she was in the classroom first. Once I know my final class list I will write each student's name on a fish. There are 3 large bulletin boards inside the classroom. This is a photo of the 3rd bulletin board which I decorated since again I didn't know which bulletin board I should claim for my class. The kiddos LOVE their sticker books or at least they will. Can you tell I love bright colours? Thanks to Nikki @ Melonheadz and Krista @ Creative Clips for making my ocean themed class décor complete. I will write each student's name in the white oval once I get the final class list. I know it is a big no no for some teachers out there but YES on this card is lists: #1- my name, #2- the school's phone number, #3-my cell number, #4- my school email & #5- our class blog. Many teachers have many reasons not to give out their personal cell number and one day when I come across that crazy parent I will probably stop but for now I like parents having my number. I am very straight up with my parents & let them know what is & what is not okay. Even though the parents have to call the school to let them know that their child won't be coming to school that day, I prefer a text letting me know & why. Our Line Leader display... I'll write each kiddo's name on that white space right before we start school. I also put up our "How We Go Home" sign! This Class Decor Pack has definitely been a buyer favourite this week!!! How does it work having 2 teachers? Do you have 50 kids? Is the other teacher an aide? You look very prepared! Luckily no I do not have 50 kids though their is a class like that is a grade 4 class. In Alberta, Canada kindergarten is only part time so my students will come to school Monday, Wednesday and every other Friday. The other teacher's class will come to school Tuesday, Thursday and every other Friday (opposite of mine). Normally a kindergarten teacher teaches 2 sets of students but the other teacher will be teaching music on the Mondays/Wednesdays so we won't both be in the classroom at the same time. We just have to share a classroom this year, but last year she taught kindergarten on the Mon./Wed. as well. I'm hoping they'll get a full time 5 days a week kindergarten soon. :) And thanks! I try to be over prepared if that's possible. Your room looks ah-mazing! I wish I was in your class!!! Did you make the poofy things on the blue bulletin board? They are cute. Thanks Amanda! No, I wish. I totally cheated and got them at a dollar store called A Buck or Two. It came with 3 in a set for $8.00. I know you can make them though. Hi! 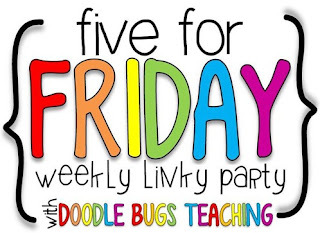 I'm stopping by from Five for Friday! Last year I switched from Kindergarten to seventh grade. I miss having the displays with all the students' names. I still think I might try to add a big one in my hallway this year. I think it definitely creates a sense of community in the classroom! Have a great year! Oh wow! Kindergarten to 7th grade!!! I couldn't imagine. That's a big change. I totally agree with you- I think it does create sense of community. Thanks for stopping by! My name is Brittany. I am an elementary teacher who loves teaching and watching children grow. 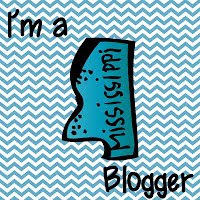 I love getting inspired from other educational blogs & building teacher-blogger friendships. I taught 1st grade for 1 yr. & kindergarten for 3 years. 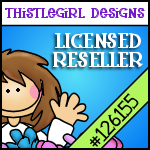 This upcoming year I will be teaching kindergarten again, as well as grade 2. My biggest adventure is my daughter who was born in September of 2014. She is my everything.